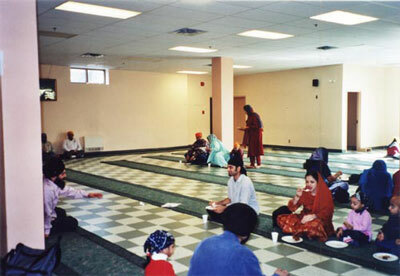 On Sunday March 10th, 2002 our group, which consisted of myself, Sean, Sunny, and Margaux visited the Gurudwara Sahib of Greater Montreal (also known as D.D.O.). We arrived at the Gurudwara at 10:30 am and made our way inside. At this time I would like to mention that our contact was not available, but their many helping people who made our visit hospitable and informative (their names will be mentioned later). The sangat (congregation) was starting to arrive at that time as well. The four of us decided to do matha tehk (bowing in front of the Guru Granth Sahib for respect) and then proceed downstairs to the langar hall (community kitchen) for breakfast. There was plenty of food ex: samosas, pakoras, burfees, and chai and it was all delicious. We then introduced ourselves to Sadhar Gurmeet Singh, who is in charge of the langar and he directed us to two gentlemen who were more then willing to help us. Their names are as follows: Sadhar Gurdev Singh Chema, and Sadhar Randhir Singh Birdi. These two gentlemen took us on a nice detailed tour of the place and answered all of our questions with no hesitation. They also distributed some beautiful calenders and a captivating letter head for our records of our visit. This was a very enlightening experience and the day would just get better. When one goes to Guruduwara the intent is to embrace the religious services more than anything else. Religious services in a Guruduwara consist of kirtan (hymn singing), reading from the Guru Granth Sahib (Sikh Holy Book), a final congregational prayer known as Aardas and lastly, the distribution of parshad (holy sweet). 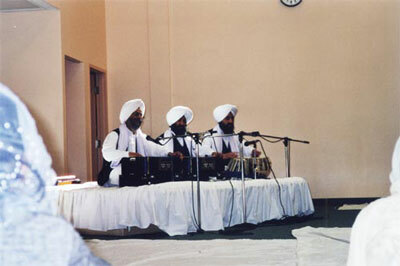 As I understand it, any member of the congregation may perform kirtan be they man or woman. The order, (not by law but by practice) usually begins with the youth, followed by adults and lastly the Raagis (hymn singers). At the Guruduwara that we visited (which was D.D.O) the Raagis were often visitors whose profession was hymn singing. The Raagis were provided with food and shelter. Upon our arrival the Raagis had already begun singing the hymns. The person responsible for reading the Guru Granth Sahib was the head Granthi, in this case male. However, it should be noted that any member of the sangat (congregation), once again regardless of gender, who can read Gurmukhi is allowed to read from the Guru Granth Sahib. The case was the same for Aardas. Any member of the sangat is allowed to give Aardas, whereas on the day we went the head Granthi offered Ardas. Pa shad was distributed by a number of men; nevertheless women could have distributed it while the napkins were handed out by the youth. The facility, a relatively new building, (from outside) was exquisite. The inside fell in step with the outside and was equally impressive. One would enter the prayer hall from doors that opened to an aisle. On both sides sat members of the sangat and the aisle itself led to the altar. Upon entering the prayer hall, members of the sangat followed the aisle to the altar where they would match tekh (bowing your head in humility to the Guru Granth Sahib). The size of the prayer hall (as measured by its dimensions) was 100 feet by 80 feet. The altar, as previously mentioned, was at the end of a walkway, and was found to be in the center at one end in the prayer hall. The congregation was organized in a seating arrangement such that the men were on the right and the woman on the left as one entered the prayer hall. In the Guruduwara when the religious services came to an end the sangat made its way to the langar hall, to partake in a group meal. The seating during langar was not the same as it was during the religious services. The various members of the sangat took a seat wherever they chose regardless of gender. The food service began cafeteria style and any desired food thereafter was obtained through service style. The food was served to members of the sangat by other members of the sangat. This service of food was a form of sewa (selfless service). Members of the sangat cooked the meal and cleaned the dishes, kitchen and langar hall. The provisions for cooking at D.D.O are provided by Gurmeet Singh (head of langar hall). 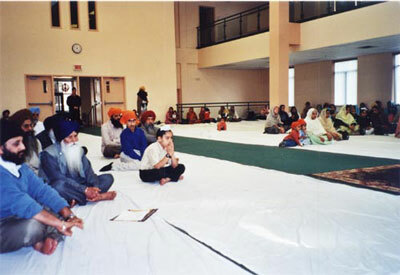 As one would find in a Catholic Church, the Sikh Gurduwara holds classes for the youth as the parents sit with the rest of the sangat and listen to kirtan. The classes are primarily aimed at children of 4 through to 14 years of age. These classes are not limited to religion there are also Punjabi language classes. The Punjabi classes are held every Saturday and Sunday with Mohinder Kaur as the instructor. In addition to the Punjabi classes, as one would suspect, are religious classes that are also held every Saturday and Sunday. Upon entering the Gurudwara, the first observation I made was the immediate segregation of man and woman. The men would go to their right and put away their shoes and coats, the women, on the other hand would go to the left. We made our way downstairs to the langar hall, for a snack, where although one might expect to see gender segregation, I did not observe any. As we made our way to sit with the sangat, I once again noticed the gender segregation. The men were seated on the right hand side of the prayer hall and the woman on the left. After much thought and discussion in class, I've come to an understanding, a conclusion of sorts, regarding the gender distinction. Although it contradicted a fundamental belief of the Sikh religion, which is gender equality, the gender segregation can be attributed more to cultural practice rather than religious practice, hi Punjab, many people have maintained the cultural practices of their Hindu ancestors. These practices distinguish man from woman and thus account for the distinctions present in the Gurudwara. When one grows up in a society and for their entire life observe certain practices these become the norm. When these immigrants came to Canada, in an effort to preserve their culture and religion, they continued with the practices of gender distinction. As we sat and enjoyed the kirtan, as performed by the Raagis, I noted that some of the children, one in particular that came to my attention, were constantly on the move inside the prayer hall. This may have been the result of a restless and indecisive child, hi one moment they would want to sit with dad and the next moment with mom, thus resulting in a back and forth shuffling. I'm sure this distraction could have been remedied if families sat together during the services. One of the first places we went to during our visit to the Gurdwara was to the langar hall where we were offered snacks (Indian foods and various sweets) as well as tea. 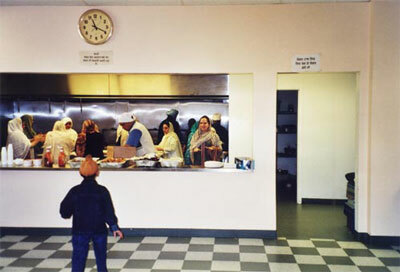 I noticed that behind the counter top, in the kitchen, men and women were continuing one of the distinguishing practices of Sikhism, they were preparing for pangat (entire congregation eats a meal together following the religious services). Both men and women were preparing the food for the day's langar. This reflected one of the fundamental practices laid down by Guru Nanak, sangat and pangat, and I can conclude that the Sikhs have made every attempt to see this remain in practice. After satisfying our appetites we made our way to the prayer hall. I noticed that all the members of the sangat covered their heads. The men did so with turbans or bandanas called rumaals the women did so with scarves called choonis. I also noticed that an elder gentleman walked into the prayer hall without a rumaal, however, nobody appeared upset, instead another person simply provided the man with a rumaal. The significance of covering one's head was simply a demonstration of veneration for the Guru Granth Sahib. During the religious services I noticed that at all times there was a person that attended to the Guru Granth Sahib. This again was a manifestation of the reverence with which the Sikhs treat the Guru Granth Sahib. As the religious services came to a close the head Granthi began the ceremony that involved putting the Guru Granth Sahib away. This was done by reciting the Benthi Chaupai, which can be found when reciting Rarahaas Sahib. 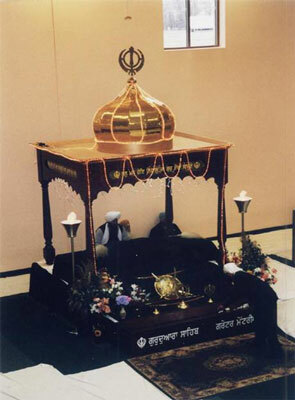 The head Granthi placed the Guru Granth Sahib on his head and proceeded into a room to put it away. As he made his way to the room various members of the sangat followed, those who remained bowed their head in respect as the Guru Granth Sahib passed them. From this I concluded that the ceremony signified not only the close of the religious services for the day but also indicated in yet another way the respect that the Sikhs have for their holy book, the Guru Granth Sahib. Throughout my lifetime I have frequently visited the Gurudwara as a child, as an adolescent and now as a young adult. This field project provided me with a greater understanding of the practices that take place in the Gurudwara. I focused on making observations as opposed to passively sitting in the sangat and listening to kirtan. The observations that were made forced me to understand what I had accepted without heavy dispute for most of my life, for example the gender segregation. With this experience I have walked away with a greater understanding of the fundamental ceremonies and procedures that take place within the walls of the Gurudwara.